“Guria’s floating school on the Mansarovar Ghat in Varanasi is popular among children at the ghats. The school—a 250-square-foot- boat—has been rented for 06,000 a month. It has 70 students on the rolls, mostly children from the boatmen community. Singh hopes the school is successful in minimising the vulnerability of these hapless children to abuses. The school runs for two hours from 5 p.m. It has a computer, a television, a DVD player and a small library. A solar panel ensures smooth supply of electricity. “Earlier these children would not study and loiter with firangis (foreign tourists). Some of them begged, shaming our city. Thanks to this school, they utilise their time in studying now,” says Shanker Manjhi, the owner of the boat. The students are given snacks after school—an incentive to ensure the children are regular. “Every day I wait for evening to come here. Unlike other schools, the teacher does not beat you nor do they get angry if I ask questions many times. Once the classes are over, I wait for my candy, ” says young Vaishali. This is a new school made by Guria on a boat along the Ganges in Varanasi (Benaras), it welcomes children from the ghats and allows them to have a good school level in order to maintain their schooling and to avoid ending up begging or being involved with prostitution and childlabor. “My greatest strength has been my stoicism. I do not want to sound like a pedantic. The day you realise you are just a speck of dust, you rise above the feeling of winning and losing. This realisation comes through an inward journey and it requires ample courage. Today “THE WEEK”, the largest selling English newsmagazine in India, selected Ajeet Singh to be “Man of the year 2011”. Congratulations to my friends Ajeet and to his wife Manju. The fight against human trafficking and prostituion is not over, together we can change…!!! Please read the interviews and the website and be aware of the story behind all this, Ajeet Singh is a true modern hero. This picture was shot a few weeks ago when Ajeet came for the first time to Paris during a short trip In Europe. It was early in the morning in front of “le Château de Versailles” (Palace of Versailles) a few hours before going back to India. Sad news, there were hundreds of people killed in flash floods and thousand of houses washed away in Leh. Over 500 people are still missing tonight (Sunday). The cloudburst, flash floods and mudslides that hit Leh town around midnight on Friday washed away government offices, paramilitary camps and residential homes. Among the worst hit are the Defence Institute of High Altitude Research (DIHAR), many local hotels and shops. With road and air connectivity disrupted and phone lines down, Leh has been cut off from rest of the world since Thursday night. The disruption in communication system has affected the rescue work undertaken by the Army as well as other paramilitary personnel. Over 6,000 army men and troopers of the Indo-Tibetan Border Police (ITBP) are involved in the massive relief and rescue operation and are assisting the local administration. Airtel whose network is still operating in Leh, has issued SIM cards to the local administration for setting up helplines. I never thought that this could happen in such a place which was a piece of heaven. 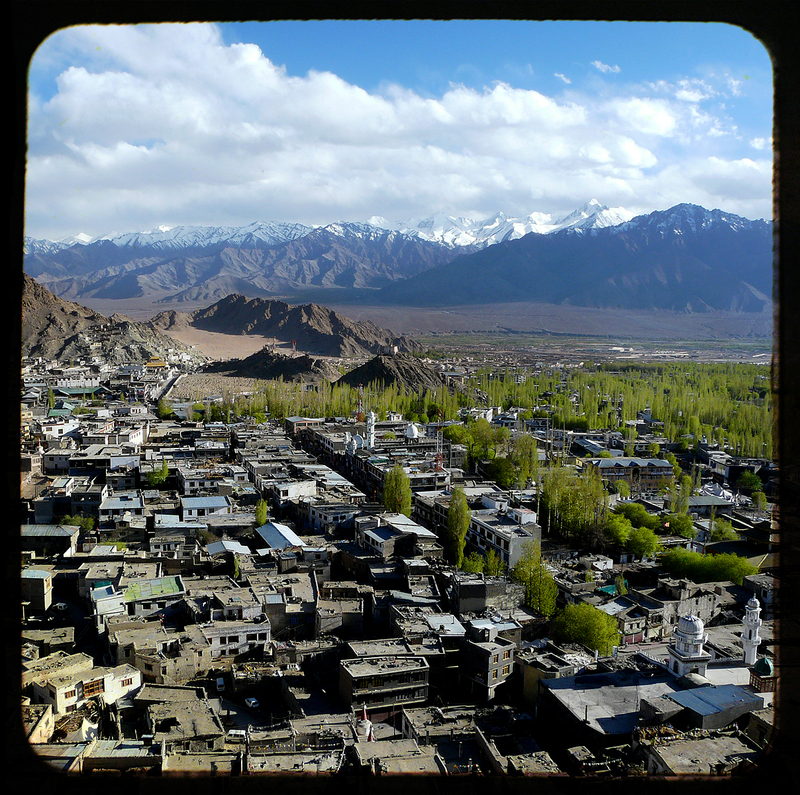 This is a view of Leh, the capital of the Himalayan kingdom of Ladakh which is in the Indian state of Jammu and Kashmir. It was shot from a terrace at Leh Palace, a former home of the royal family of Ladakh. Leh is at an altitude of 3,524 meters (11,483 ft), it is spread over 45,110 sq. km, and comprises the main town and 12 adjacent villages..
For centuries it has been an important stopover on trade routes along the Indus Valley between Tibet to the east, Kashmir to the west and also between India and China. “In the name of the best within you, do not sacrifice this world to those who are its worst. In the name of the values that keep you alive, do not let your vision of man be distorted by the ugly, the cowardly, the mindless in those who have never achieved his title. Do not lose your knowledge that man’s proper estate is an upright posture, an intransigent mind and a step that travels unlimited roads. Do not let your fire go out, spark by irreplaceable spark, in the hopeless swamps of the approximate, the not-quite, the not-yet, the not-at-all. Do not let the hero in your soul perish, in lonely frustration for the life you deserved, but have never been able to reach. This is a portrait of Ajeet Singh who is running with his wife Manju an non-profit organisation named GURIA, in Varanasi (Benaras). Guria is a Human Rights organisation fighting against the sexual exploitation of women and children, particularly those forced into prostitution and trafficking. Ajeet is a modern hero providing shelter and hope to many children. He has succeeded in making Varanasi the only city in India with a child prostitute free red light area. GURIA has earned widespread support and work both with the Indian government and with international organisations including UN, Asian Human Rights Commission, Frontline, Geneva Global and Action Aid. 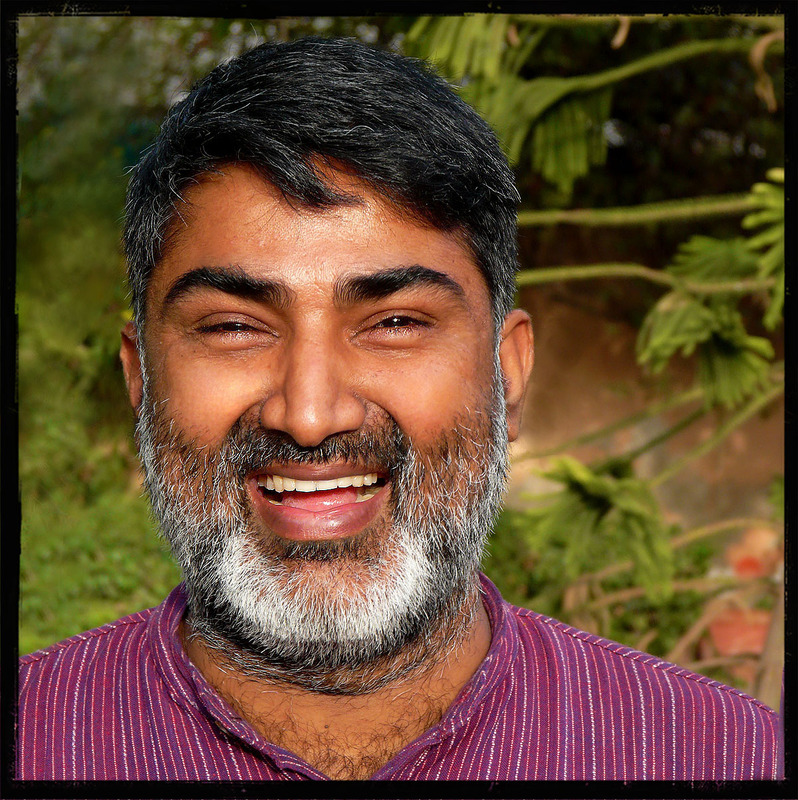 In May 2010 Ajeet was one of only five people in the world nominated for the annual Frontline Human Rights Defenders at Risk Award, given to those who have made outstanding contributions to human rights at great personal risk. “FREDOM NOW”, a charity concert with internationally renowned artists Yousuf Ali Khan (tabla), Nicolas Magriel (sarangi), Amie Maciszewski (sitar) and famous sarode player Aashish Khan, will be held in support of Guria in London on July 9TH 2010 at the Bharatiya Vidya Bhavan in West Kensington. This was shot a few days ago in the garden of my office in Varanasi (Benaras). “Hope begins in the dark, the stubborn hope that if you just show up and try to do the right thing, the dawn will come. This was shot in the little yard which is at Guria, in Varanasi (Benaras). Manju joined those girls for a few pictures around a well water pump. Manju and her husband Ajeet Singh are running this non-profit organisation at great personal risk, providing shelter and hope to many children. They need any kind of help (money, food, toys, clothes,…) in order to carry on their task. They are facing many difficulties from all those who would like to use those children as a second generation prostitution. A few days ago they were nominated for the 2010 Front Line Award, an international foundation for the protection of Human Rights defenders. Manju and Ajeet Singh are modern heroes, this is why I decided to upload a few pictures connected to their work. In this file there are many happy faces belonging to amazing children who have hope for a better future. Guria means doll in Hindi and those happy girls are like dolls and I would like to thank all of you with their smiles for commenting so nicely those pictures, I’ll give them all your kind messages in a few days. 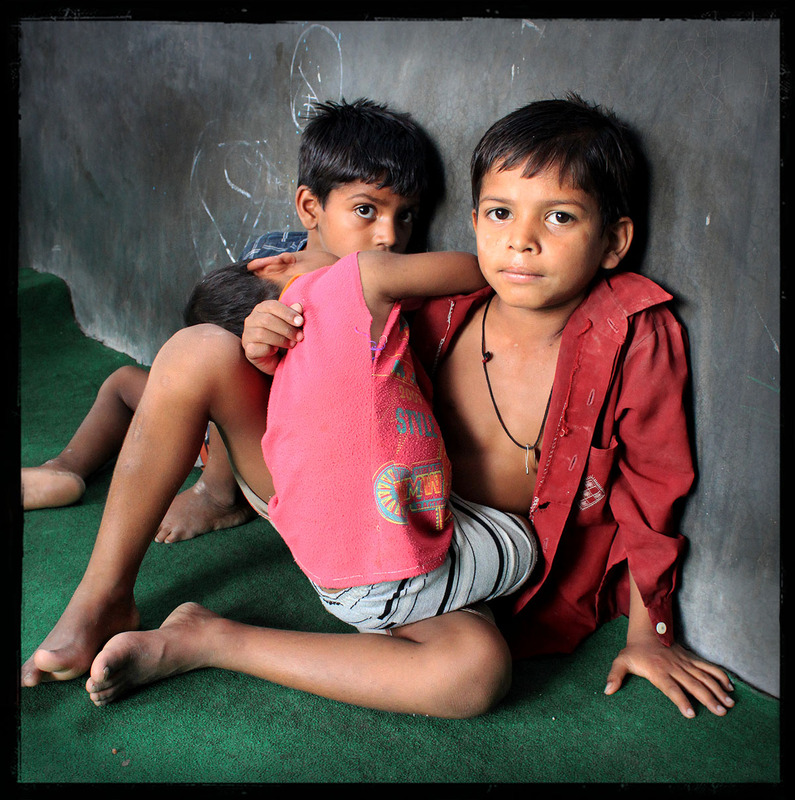 This was shot in the little classroom at Guria, in Varanasi (Benaras). Manju was commenting the artwork done by a few children. Guria means doll in Hindi. Among the many children I met at Guria, this one might be the only one who didn’t smile to me. He was wondering who I was, maybe he was scared even though he seemed to be brave. He was holding this younger boy in his arms, I don’t know if he was his brother, anyway Guria is a place where I felt a real brotherhood among all the children. When I asked their names I realized that they were from several religions. Guria is a Human Rights organisation in Varanasi (Benaras) fighting against the sexual exploitation of women and children, particularly those forced into prostitution and trafficking.